Council meeting agendas are often difficult for people to navigate. Filled with jargon and legal requirements on how an item must be listed, it can be a challenge to determine what Council members are actually discussing or deciding on. What follows is a staff interpretation of the agendas. ** The agenda was revised. The original item 1 has been continued to a future meeting and a new item has been added in its place. Work Meetings are designed to be a less formal venue for discussion among Council Members. Generally, no public input is taken during the meeting. Council's Rules Committee has proposed some clarifications regarding terminology in the City Code that defines Municipal Council Committees. Each year the Council must set and approve the assignments for Council members working on various boards and committees. The chair and vice chair for each committee is also set at this time. This is a renewal of Comcast’s franchise agreement to be able to operate in Provo City. This is a proposed joint resolution of the Mayor and Council to request that the Utah State Legislature sustain budgetary support of the LeRay McAllister Fund, created to help permanently protect Utah’s agricultural lands. This is being requested by the Sustainability Committee. the Timp-Kiwanis Park property owned by Provo City. Over the past year the Parks and Recreation Department has been working with Clegg Consult and the State to remove the LWCF designation on Timp-Kiwanis Park. Upon approval of this conversion, Parks and Recreation proposes that the property is surplussed and sold to Provo School District. Provo School District needs the property to meet Title IX requirements. The proceeds of the purchase are required to be used to purchase land only. The December 5, 2017 Work Meeting minutes were continued to a future Work Meeting agenda, and the remaining minutes were approved by unanimous consent. A motion to place this item on the Work and Council Meeting agendas on January 23, 2018 was Approved 7:0. 2. 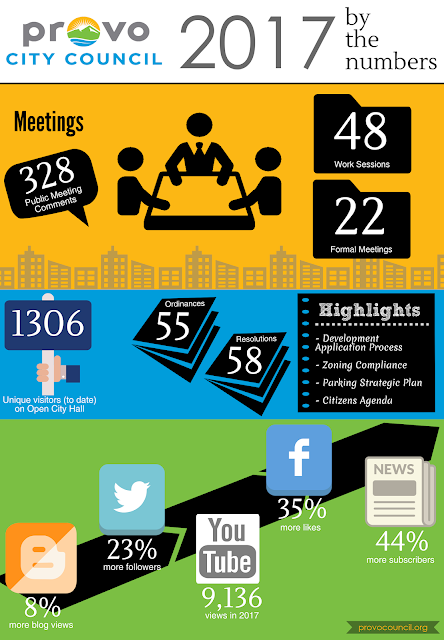 A recap on Council's 2016-2017 Priorities (17-011) Presentation only. A motion to continue the update of the General Plan and align it with Vision 2030, incorporating any portions of Vision 2050 which have completed the review process to date, then once the General Plan update is complete to continue with the process for updating Vision 2050 as guided by the Administration was Approved 6:1, with David Harding opposed. Council member David Harding shared proposed changes to section 10 for Vision 2050. Council members David Harding and George Handley will make further revisions to this draft and share with Council members for input throughout the process, before bringing this item back to a future meeting. A motion to change the word “reject” to “protect against” and to send this resolution to a future Council Meeting for approval with the change was Approved 7:0. As we head into the new year, here's a look back at 2017. Thank you for engaging with us and letting us know your thoughts and concerns. 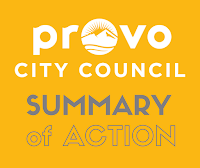 Watch for more topics on Open City Hall and remember that you can send an email to all seven Council Members by using council@provo.org. Comment below (requires Google+ account), on our Facebook page, through our online comment form, or by contacting Council Members directly. 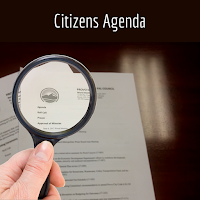 Comments/input on items appearing on an upcoming meeting agenda will be compiled and provided to Council Members the day before the meeting. **Note - your comments will be part of the public record. The Sustainability Committee and Agricultural Commission were established by the Mayor and present a report to the Council twice each year. The group will also be making a request that the City of Provo approve a resolution requesting that the Utah State Legislature sustain budgetary support of the LeRay McAllister Fund, created to help permanently protect Utah’s agricultural lands. Council established a list of priorities in early 2016 and decided in 2017 to continue to focus on the same priorities. Council staff will give an update on the progress in each priority area as Council members prepare to consider their priorities moving forward. 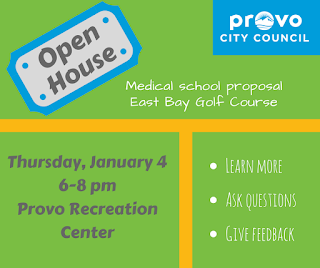 Provo City has received a proposal that would involve building a medical school on a portion of the East Bay Golf Course. We previously asked for your comments in preparation for the Council meeting on December 5, 2017. At that meeting, Council members voted to hold a public hearing regarding the possibility of placing the portion of the golf course property on the surplus property list. This hearing will be at the January 9, 2018, Council meeting. 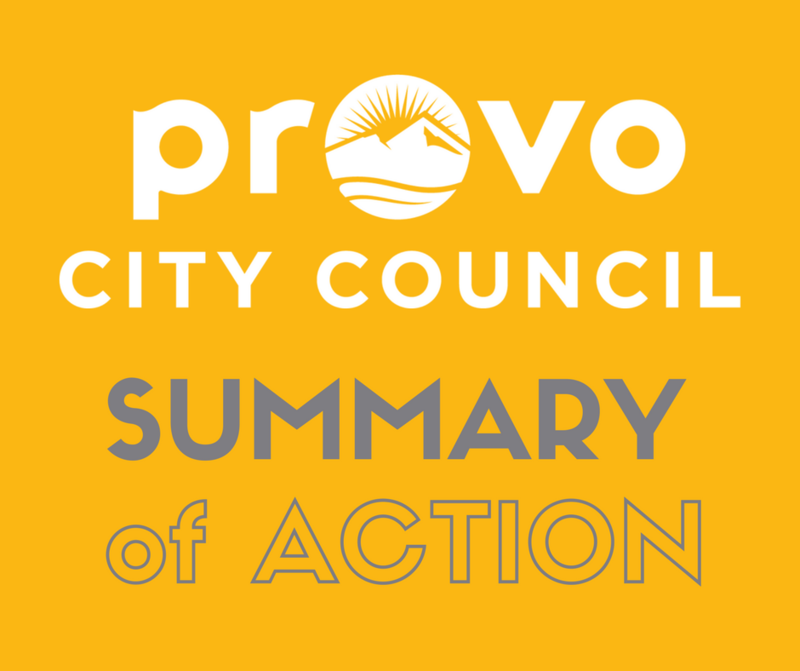 Since the original presentation on November 21 and the updates on December 5, Wasatch Educational, Provo Parks and Recreation, Provo City Administration, and East Bay Golf Course have refined the proposal to ensure a better balance between the development and the existing uses of the site. Information on this updated proposal can be found on Open City Hall as well as an opportunity to contribute your comments so they can be shared with Council members in preparation for the January 9 public hearing. Please join us for the Council Inauguration. This will also be broadcast on the Council's YouTube channel. 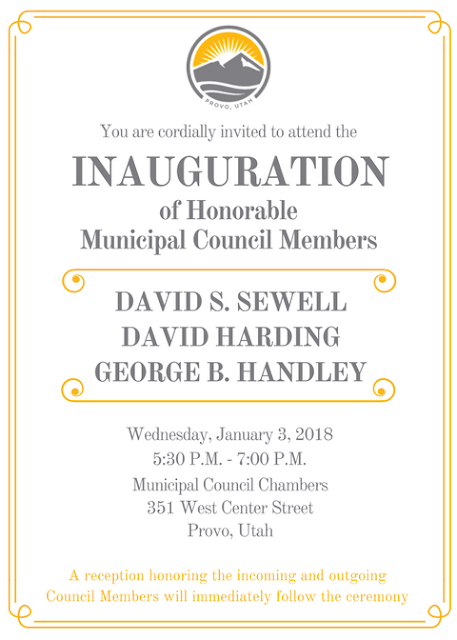 Inauguration for the Mayor will be done at a separate event on January 18. ANY PROFANE OR ABUSIVE COMMENTS WILL BE DELETED.